This photograph by the Burton Brothers shows a glass case containing some of the wildlife found on Karewa Island off Tauranga. 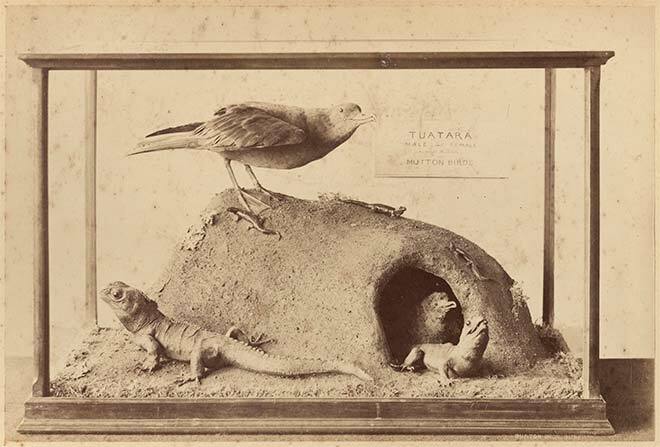 The diorama includes a muttonbird (or sooty shearwater) chick in its burrow, an adult bird above, two tuatara and, on the top of the burrow, three small geckos. As was usual at other 19th-century exhibitions, the country's birds and animals were well represented at the New Zealand and South Seas Exhibition.